Do you enjoy playing with little kids and are you passionate about education? 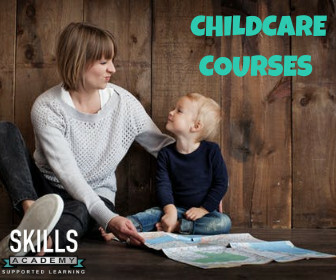 Our childcare courses will teach you the basics of child development. We have courses that will teach you about child psychology and first aid, and you can also learn about opening a day care or créche. With our Child Day Care courses, you will learn how to help children through this part of their lives. You will be able to encourage them through games and toys, and you will teach them to share and play with others. With our Child Day Care courses, you will learn how to work with children and provide a safe environment for them. This 4-month short course consists primarily of two subjects. Teaching you all the basics of working at a day care. This covers all standard subjects as well as a few extra. It is a 12-month course and only needs Grade 10 as entrance criteria. This standard course in this field of study. It is an 8-month course that covers all the necessities of working in the Child Day Care field. Do you take an interest in what influences a child’s behaviour? Then one of our Child Psychology courses will suit you. You will examine how children develop their emotions, make conversation and so forth. This is a 4-month short course, covering all the primary subjects of Child Psychology. The course covers all standard subjects, but has more in-depth modules than the Proficiency course. It is a 12-month course and only requires Grade 10 as entrance criteria. This is an 8-month course that covers all the necessities of working as a Child Psychologist. You will learn the basics about starting your own business and managing staff. Crèche Management is about making sure that children are in a safe environment. This course is for someone that would like to manage a crèche. It is a short 4-month course that covers all the necessary subjects of Crèche Management. It is a 12-month course and only requires Grade 10 as entrance criteria. The course covers all standard subjects and a few extra. There are more in-depth subjects than the Proficiency course. This 8-month course covers all the necessities in managing a crèche. It is a standard course in this field of study. Holding a First Aid certificate is always something good to put on your CV. You will gain life support skills and the knowledge of applying it in emergencies. An excellent course for any individual to have behind their names. This skill can help you in any various work environments and push you above the rest. Experts say that the growth of a child happens before they start school. With childcare, you will teach children to get along with others. Childcare makes you feel good about making sure children grow up to be respectful and well behaved human beings. Why should you study childcare? Many parents work full-time jobs. They need someone to take care of their children while they are at work. Child daycares will always be in demand. Here are more reasons why you should be studying childcare. Holding a childcare certificate will gain trust from those who would like to employ you. The courses will help you to care better for children. You will be witnessing how these mini-humans experience things for the first time in the world. There are many careers possibilities when studying Childcare. Have a look at some of the careers and their salaries per year. All information was correct and updated on 25 August 2018 on Payscale. In today’s fast-paced world, you have to learn to do more than one thing at the same time. Taking time off to finish your studies might be taking you away from work. It could leave you without having money or experience. At the same time, studies are equally as important. They give you the skills to be better and learn more. With distance learning, you can work and study. We are a distance learning college with accredited and non-accredited courses. If you need help with your studies, one of our expert tutors can assist you. You can also form part of an online study group and chat with other students doing the same subjects as you. Contact us on our toll-free number 0800 39 00 27, and one of our friendly consultants will assist you. You can also complete our form on the left-hand side of this page. Are you not sure What Course to Study?